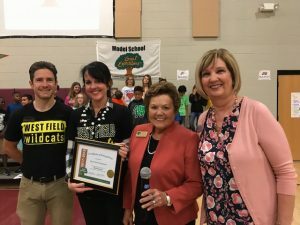 Cross Timbers Elementary and West Field Elementary recently achieved the prestigious honor of being named Great Expectations Model Schools. The school’s principals, teachers, and staff worked diligently to accomplish this impressive goal. Great Expectations schools have a culture of respect and high academic achievement. The Great Expectations Program, founded in 1991, is a scientifically-based research educational reform model that is bringing major change and innovation to PK-12 public and private school classrooms in Oklahoma and beyond. The program represents an approach to learning that empowers teachers to expect and to get the best from students; it rekindles the excitement of discovery among both students and teachers, and it pushes everyone involved to greater heights of achievement. The basic principles of the program are: high expectations for students, a learning climate based on mutual respect between student and teacher, student self-esteem, a belief that all students can learn, positive teacher attitude, and highly skilled and knowledgeable teachers who inspire and enable students to achieve success. Over 40,000 educators have been trained in the GE Methodology. There are currently 120 GE Model schools in Oklahoma, Texas, and Kansas.